All models are made from the most durable grade of superlinear poly available! 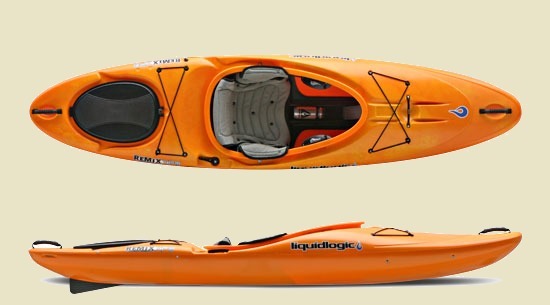 Scroll down this page to see some of the LiquidLogic kayaks we have in stock. Whitewater or Flatwater; Remix XP 9.
that is until now. The Remix XP was designed to bridge the gap between the two once and for all. The Remix XP is an extension of our popular river runner series and although its roots are firmly planted in whitewater the XP's extended waterline allows it to cruise the flats with ease. The XP has an integral skeg which when deployed offers superb tracking but with the skeg tucked away the XP offers the agility needed to excel on whitewater. Liquid Logic Kayaks -made in USA by Legacy PaddleSports.